2. Is it a boy or a girl? 3. Is this your first? Q: HELP!! My wife/girlfriend got angry at me and says I never help around the house but I totally did the dishes once last week! She used to be so happy and carefree and let me do whatever I wanted and made me sandwiches all the time. What is going on?! A: Relax, bro! It's just hormones. Women just go inexplicably crazy when they are pregnant. It's for sure nothing you are doing. I do admit that my BS tolerance levels are at an all-time low, but I don't attribute this to "crazy hormones." It's not comfortable being pregnant and it never lets up. You are building a new person 24/7 for nine months and you're already not getting your usual amount of sleep. You need help. You're nervous, excited, scared, responsible for every step of that little human's growth and in a great deal of physical discomfort. You can't have a glass of wine to unwind and I sure didn't get to do any of my usual "stress busting" activities (see photos, below). Hormones were the least of my concerns. Sure, there was the occasional "silly" tear shed for pet food commercials and at movies that weren't tragically sad, but hey, if you don't cry during that Sarah McLaughlin Humane Society commercial, you probably don't have a soul. Sigh... I know I will get to do these things again, but I have really missed them over the past nine months. I don't have a clue what I am doing. Apparently. I've never read a book on pregnancy. Never looked it up online (what is Google?) I don't have a doctor I can talk to. I have no maternal instincts. I've never even known anyone else in my entire life who has been pregnant and can tell me things about pregnancy (e.g. my own mother). I am SO HAPPY you know everything about my "condition," person I hardly know! Please enlighten me. One woman tracked my every movement every day: Did I know I couldn't eat feta? I should probably sell my cat because of her litter box? I should probably leave my boyfriend because he will be just like her ex husband? My showers are too hot? No wait... too cold? I should see my doctor more often? I shouldn't get my hair dyed? I shouldn't drink coffee? I should eat more, even if it doesn't seem appetizing? I wish it ended there, but this woman had me wondering if I should just quarantine myself. As if it's not stressful enough that so much of the information out there is conflicting. Week 4: poppyseed. Okay. Yeah, I got that. He's tiny. Week 5: appleseed. Yep. I can see that. Week 6: pea. Again. Pretty consistent. He's pea sized. Got it. Week 8: raspberry. Okay? Is he not growing? Let's jump ahead to week 11: lime. Okay. That's bigger than a raspberry. Got it. Next week, I will be at week 40: jackfruit. Whatever the f*&$ that is. Why do I even want to envision him as something edible anyway? Maybe that's why people dress their babies as food for Halloween. Pregnant women are smug. Hmm. I was feeling a lot of things: tired, happy, sad, brooding, worried, alone, scared, overwhelmed, gassy, bloated, lazy... Sorry Garfunkel and Oates, but smug just wasn't one of them! Ah, Futurama! One of the few things on television that actually fact checks their science references... and takes great pleasure in ripping apart things that don't. The recent meteor event in Russia has made me wish that newscasters and blog writers had Morbo sitting next to them whenever they made some lame joke or speculation about some scientific phenomenon. I suppose the news stopped being objective and checking their facts a long time ago, and about more than just science, but the confidence with which newscasters and writers present their scientific "facts" really irritates me. (Please ignore the fact that this video clip is coming from a UFO playlist- it is a very much identified falling object.) First of all "I tracked those meteors..." No you didn't. You simply did a Google search to see if there were any meteor showers that happened to be taking place when the footage was captured. Also, meteors don't actually come from constellations, they just appear to. Constellations are apparent arrangements of stars many light years away, not throwers of fireballs. And while the name "Quadrands Muralis" is obsolete, constellations do not "go extinct." We just decide we don't like them anymore. Then we have "they are often hard to see because the northern sky is usually cloudy." That's right. Clouds like to gather in the north... for... strategic... science purposes. Forget that "The Northern Sky" is relative to where you are standing and... you know what, I'm not even going to dignify that statement with further commenting. Actually, the women who were joking around were absolutely right! This was, in fact, a Russian rocket body that entered the Earth's atmosphere, broke into pieces and fell to the ground. I suspected it was something like this the first time I saw this footage. First of all, it is moving pretty slowly. Meteors streak and burn up quite a bit faster than this. Secondly, if you compare the colors and the shapes of the fragments to actual man-made objects burning in the atmosphere (sadly, the Columbia footage comes to mind), this what it looks like. Then the facepalm moment. "I mean you know it all, Tomer. YOU'RE OUR METEOROLOGIST?!" A. Meteorology is not astronomy. B. Please see my comment about "northern clouds." An actual weather scientist should know better. The reason the recent Russia event reminded me of this was that I am getting sick of every streak of light being attributed to a "meteor shower." I wish the above footage is what a meteor shower looked like! It would make those chilly early morning trips to the mountains so much more exciting than the 10-15 quick streaks you actually end up seeing. Comet: A relatively small, at times active, object whose ices can vaporize in sunlight forming an atmosphere (coma) of dust and gas and, sometimes, a tail of dust and/or gas. Meteoroid: A small particle from a comet or asteroid orbiting the Sun. Meteor: The light phenomena which results when a meteoroid enters the Earth's atmosphere and vaporizes; a shooting star. Meteorite: A meteoroid that survives its passage through the Earth's atmosphere and lands upon the Earth's surface. So, an asteroid or a meteoroid enters the Earth's atmosphere where it become a meteor. It either burns up or it makes it to the surface as a meteorite. OR in the case of the Russian event, it's a bolide, or fireball or in this particular case, a "detonating fireball." Pretty cool, right? Contrast that with a meteor shower. Meteor showers occur when the Earth passes through clouds of debris from comets. Yes, you can have all of that excitement in a meteor shower, but usually what you have is tiny streaks across the sky over several hours. Still cool, but not quite as spectacular as either of the two videos above. They are also global events (you can't have a Russian meteor shower, for example) and come like clockwork every year- not just randomly. And meteor rain? That... doesn't exist, actually. At least, not in scientific terms. A while back I thought it would be a good idea to chronicle some of my extras gigs in my blog. Then all the social networks, my day job as a web developer and my film making and screenwriting efforts made maintaining my website seem more like a chore than the fun thing I used to do. This is a return to that. I'm not going to make the promise that I will regularly update (a promise that I will inevitably break), but I would like to get back in the habit. As for extras work, it was a super fun thing I did when I first moved out to Los Angeles and could afford to fart around before getting down to business. I don't mean to diminish the life of the full-time professional extra. It's actually a tough way to make money and if you can do it regularly, you are magic and I salute you. Yes, it's quite possible to make your living being a "blur" as people will so kindly refer to them (hey, ninjas are blurs too, and NO ONE messes with ninjas), but I had other aspirations and other obligations. Sadly, my blur days are becoming just that... So I want to write about them before they are gone. My first gig was 100 Questions. A very short-lived sitcom on... some network. I don't think my scene ever made it onto the small screen, but I basically had to sit in a pants suit and fake sip a fake martini. I've already written that story. I've also already written the Cold Case story, so you can catch up on those if you so desire. My third extras gig was Castle. NOW we're talking! Though I don't watch it regularly, I do enjoy the show- especially the Nathan Fillion part of the show- so I was excited when they told me I would be in it. They informed me that I would be a New York subway patron. Sweet! I can play that! I lived in New York for almost four years. I know from ridin' the subway, yo! I decided to go method for this one. On that note, one thing you should know, should you desire to be an extra or find yourself on set one day: background work is NOT acting. No one appreciates your efforts to stand out. You are "background talent." Your goal is to blend in (see earlier ninja comment). Also, no one on the set really wants to hear about all of the acting you do, the workshops and schools you attended, the people you have met... Actually, scratch that. Some people do want to hear about that. And they are sitting at that table over there. Not at my table, where I am clearly trying to read American Gods by Neil Gaiman. Yes, I was being crabby on the set that night. It took far too long for me to find parking and meander through the trailers to find the 2nd AD. Plus, this was a night shoot and I'd heard rumors that we might not get done until four in the morning. There was also limited food for my then-vegetarian self to eat and I was starving. Knowing every eatery nearby would be closing soon and I would be reduced to eating chips and fruit snacks for the next six hours filled me with dread. On top of that, I found out that the scene we were shooting would have NOTHING TO DO with Nathan Fillion. At all. I have this annoying curse of being where he is- sometimes EXACTLY where he is- and never getting to see or meet him. More on that later. While I was sitting at one of the few tables that had adequate reading light and feeling sorry for my(let's face it, pretty spoiled)self, I got a call. When I answered it, the voice of my dad's partner answered back and I suddenly got very nervous. Don't get me wrong, we get along great and I love talking to her, but it was a bit odd to get a call from her late at night, knowing that it was three hours later where she was. As it turns out, I had reason to be nervous. My dad had suffered a heart attack. Now, I do love suspense, but not where my family is concerned, so let me just spoil this and spare you: he's fine. Everything turned out great. However, that information would not come to light for another few weeks and the rest of my time on set was spent worrying about him. I felt trapped. He would need a surgery and I wanted to fly out for it, but I was unable to do anything about it. I alternated between distracting myself with my book and researching flights on my ten-percent-battery-life phone. I decided the best thing for me to do would be to just finish out the night and go home. Needless to say, much of the evening was a bit of a blur after that. I remember walking with my book, trying to look like a New Yorker. I was depressed and self-occupied, so I think I pulled it off quite nicely. The one detail I do remember from the night is that I was selected to be one of the subway patrons who would go through the turnstile right as the bad guy jumped over to escape Beckett. Since my face would be in the shot, I had to pretend like I noticed, but not really care. Much like I would have reacted in New York had I seen someone jump over the turnstile. The turnstiles the actors were to jump over were very clearly marked with tape. We were told that we could go through any of the other turnstiles, but that we had to stay out of the way of the marked turnstiles. When the first take came up, I found an unmarked turnstile and set my intention to walk through it. 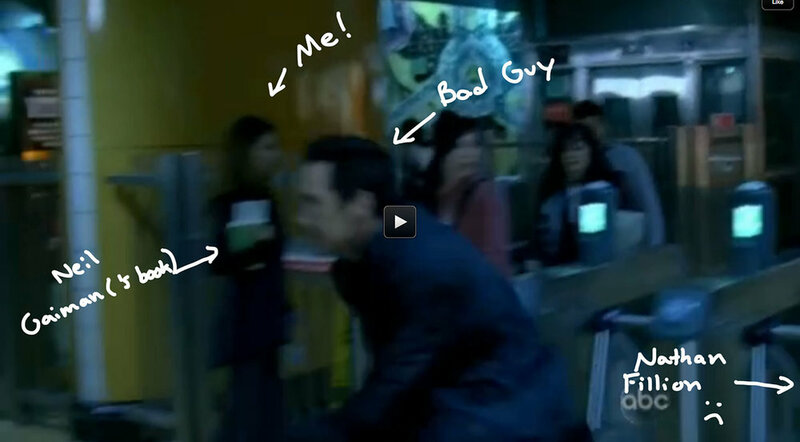 I headed toward it (without looking like I'm heading toward it) and BOOM, the bad guy jumps over the unmarked turnstile. Any look of shock I had as this actor came hurtling at me uncontrollably was completely genuine. They called a cut. No one blamed anyone (mostly because it wasn't my fault... they have no problem yelling at extras, but tend to hold back with the talent), but I was much more cautious about approaching the turnstiles on subsequent takes. I mean, I would love to be a stuntwoman, but that's a completely different pay grade with a totally different set of rules and insurance requirements. I did manage to make it in the shot, at least- see above picture. This was season 2, episode 18. I'm that blur that looks kind of like... well a rather gothy New Yorker. And see that green blur? That's my copy of American Gods (that book really did help me get through that shoot). I was later used in three other shots, but never made it onto the screen. It's pretty amazing. With the exception of two people veryone you see on the screen was an extra or a stunt person. Some of them got paid more than others. I got paid about $80 to be there that night, and I was on the lower end of that price range so... do the math. It's expensive to put bodies in scenes! 1. Turn signals no longer work. How else can we account for the complete lack of them? I hypothesize that either the precipitation seeps into most vehicles' electrical systems and attacks only the turn signal functionality, or that the rain droplets somehow refract the light from turn signals so that they go unseen by the drivers behind or around them. Both of these explanations satisfactorily explain why visual signals are rendered useless, but horn-honking functionality remains unaffected. 2. Braking can only be applied forcefully and suddenly. Gradual braking is not an option, possibly due to the coefficient of friction approaching zero when there is moisture on the road. Sudden and forceful braking must be applied to overcome this. Another possibility is that the rain droplets refract light around objects and intersections, making them essentially invisible to drivers until they are literally right there and have to turn or stop. 2. Drivers can no longer see lines on the road, read road signs, or see traffic signals. I believe this is due to the refraction of light through the rain droplets. 3. The laws at intersections no longer apply. This isn't as much of a scientific problem as it is a legal one. I still haven't learned what the alt-weather laws are at four way stops, so this is probably just my fault. That or refracted light through rain droplets either cloaks vehicles completely, or alters our sense of time and space, making us unable to determine who arrived first and has the right-of-way. 4. Perspective changes and varies dramatically from person to person. An acquaintance claimed that he couldn't see ten feet in front of his vehicle while going seventy miles an hour down the highway on his way in to work. This cannot possibly be the case, as visibility was not limited and it is impossible for any vehicle to move at seventy miles an hour on an L.A. freeway during rush hour. Yet he believed it so fervently and dramatically, that altered perspective (possibly due to refraction of light waves by rain droplets) is the only explanation. 5. Wifi and cell phone signals no longer work. Okay, this one isn't related to traffic, but a guy in a hotel was explaining to me that this was the reason the internet service that I was paying $9/day to use wasn't working and he couldn't refund me. And also my calls like NEVER go through and sometimes my tweets get held up for ages. What the hell, science? The only thing I can think of is that the signals used in such devices are some how "refracted" through the rain droplets and re-routed to people who don't have AT&T or Time Warner Cable. 6. The world essentially ends. Seriously. I didn't feel like going to the beach, people had to cancel their flying trapeze and paddleboard classes and I totally didn't feel like eating at Pinkberry. This is most probably due to the refraction of joy out of life by rain droplets. You might detect some sarcasm in this post (and a lot of refraction). It's not that I don't appreciate that relatively speaking, a couple of days of rain is a monsoon and forty degrees is freezing, it's just that, well come on, SoCal. You are where the weather forecaster stands when talking about weather happening in the rest of the country. After weeks of dialing and dialing, I got my first gig in November of 2009: Bar Patron on the NBC summer season sitcom "100 Questions" (note: this episode will air on Friday. I will try to update with a screencap if I can get one). Since this was going to be my first time on a big television set, I was really excited for the job. That is... until someone not only took the wind out of my sails, but shot a canon through the side of my enthusiasm ship by informing me that you haven't really arrived on the extras scene unless you're in a summer blockbuster and THEY call YOU. Dually noted. From my new perspective on the bottom of the "T'ain't-nothin'" Ocean, I prepared myself for my experience. I was told to come "hair-and-makeup-ready" (this industry is filled with terms spawned from bad English, more on that later), which required the purchase of makeup. I ended up spending about $50 to make my $8/hour. I took one stealthy picture of my costume in the bathroom because I was terrified of being sued or killed. I also respect the "No Spoilers" rule and the concept of "sensitive information," so it's not just a matter of self preservation. I've since learned that a picture of myself in a business suit does not count as "sensitive information." In fact, how do you know this is not just a picture of me from some office job in 2002? I met people who were happy to be there and revved up about the industry, and jaded, miserable folks who should probably seek out other careers. I found myself somewhere in between. "Content" would be the best way to put it. After all was said and done, though, I'd had enough fun that I decided to try to land another gig.